The prayer shawl is complete, blessed and gone to its recipient. I feel very lucky to have had the opportunity to knit for such a great cause. During grief, loss or strife, to have something warm, soft and cozy wrapped around your shoulders is comforting. I cast on for this project on October 20, 2009. The yarn came from Your Local Yarn Shop in Battle Creek. It is Classic Elite Alpaca Sox in green. This yarn is so soft and comfy, that I could snuggle in it all day long. Taking two skeins was a bit expensive, but well worth the cost. 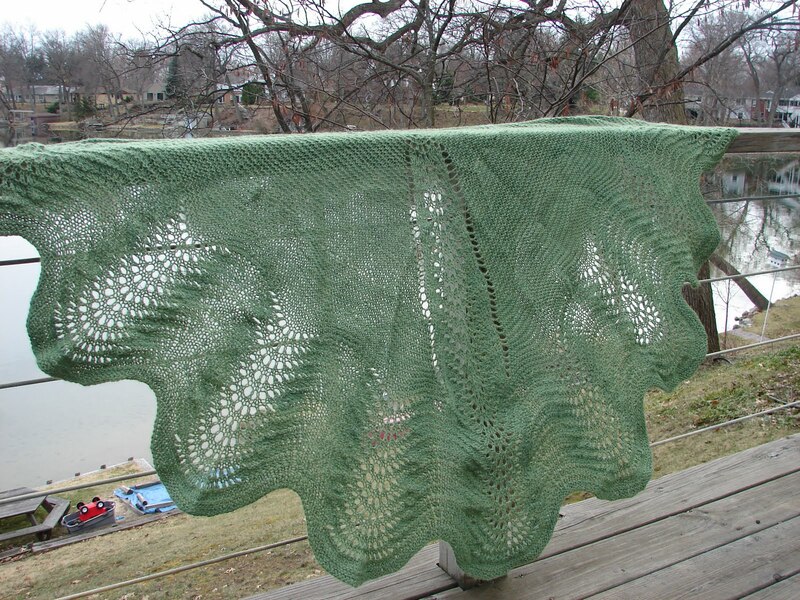 The pattern is the Scalloped Lace Shawl Pattern by Kristin Omdahl. It also came from Your Local Yarn Shop. They have a knit sample that is fantastic! Their shawl is done in orange solid yarn for the body and a variegated orange for the scalloped trim. It’s stunning. So, I finished mine on January 19, 2010. There were some small “bumps” along the way. But if you don’t look for them, you can’t see them. Now that’s a typical response for me. 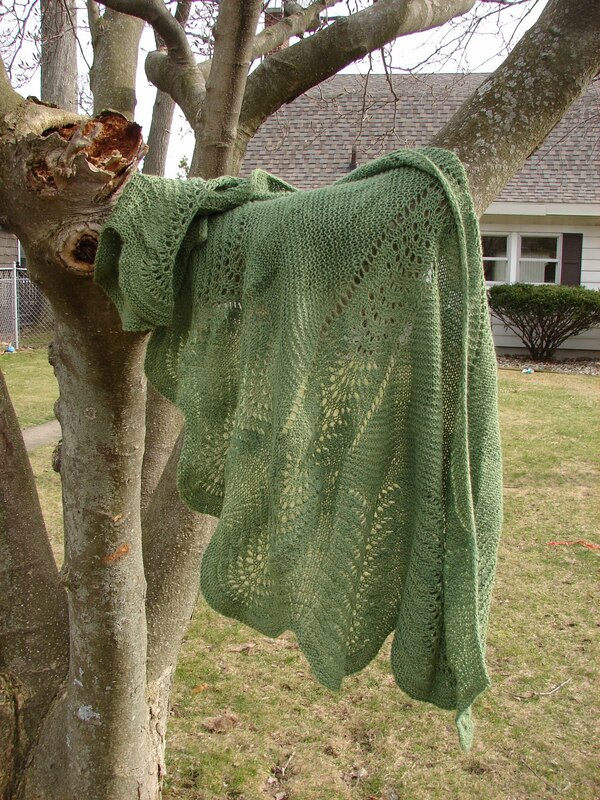 Hopefully, the person who receives this shawl won’t mind. Blocking the shawl was a challenge, due to its size. I ended up laying plastic bags down on a full size mattress with towels over the top of that. Then I started pinning. And pinning. And pinning. After that I kept creeping back into the bedroom to adjust a pin here, move a pin there and make final changes. Wow. Now, I can see why blocking wires are a good thing. One thing I did observe about this pattern is that you need to bind off in much larger needles. I went up to a 10.5 US to keep the stitches as loose as possible. The other recommendation I would make is to definitely take the extra time for the I-cord bind off. It gives the piece a "finished" look that I really favored.